880: number of evangelical megachurches in U.S.
50: number of megachurches in 1980. Every 2 weeks: time it takes for a new megachurch to emerge in U.S.
•	Senior “pastor” of Lakewood church in Houston, Texas. Over 7 million: number of weekly viewers in Joel Osteen’s TV ministry. More than 100: number of nations that broadcast his TV show. 1997: Married wife Victoria. They have two children, Jonathan and Alexandra. Compaq Center: once home of the Houston Rockets NBA team, is now the Lakewood church. Seats 16,000. •	October 3, 1999 Osteen took over from his father as pastor of their church; Lakewood church after his father passed away. •	Prior to this role he had preached only once. •	Osteen was listed amongst the ‘ten most fascinating people’ in December 2006. •	In the same year he was accorded the recognition as the most inspiring Christian in the United States. •	Does not take a salary from the Lakewood church whose annual budget is $70 million. •	Osteen’s book sales and related stuff generates a reported $55 million. •	Owns one house, the one he lived in for 13 years. •	Until recently, drove 9 year old car owned by his father. •	His services net $43 million a year. What is Joel Osteen’s Birthday? What is Joel Osteen’s Sign? How Tall Is Joel Osteen? •	His first five books, “Your Best Life Now,” “Become a Better You,” “It’s Your Time,” “Every Day A Friday,” and “I Declare,” have all been #1 national bestsellers. •	“Your Best Life Now” was on The New York Times Bestsellers List for more than 200 weeks. •	According to Nielsen Media, Osteen’s weekly program is watched by more than 10 million American viewers. •	Osteen’s weekly program airs in approximately 100 nations around the world. 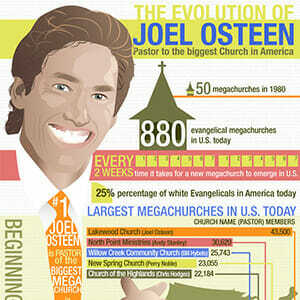 •	Osteen has filled stadiums in England, Northern Ireland, Canada, Israel, Africa and Australia. •	According to iTunes, Osteen’s weekly audio and video podcast has an average of 10.5 million downloads each week. •	In the past eight years, more than a two million people have attended Osteen’s “Night of Hope” events. •	In 2009, Osteen sold out Yankee Stadium in New York. •	Lakewood’s 2005 grand opening was attended by Texas Republican Gov. Rick Perry as well as Democratic House Minority Leader Nancy Pelosi. •	President Obama hosted the Osteens at the White House. •	In 2006, Barbara Walters named Osteen one of her “Most Fascinating People” of the year.